Born in Teocaltiche in the Mexican state of Jalisco. His work has been exhibited widely in more than 140 exhibitions throughout Mexico and abroad. 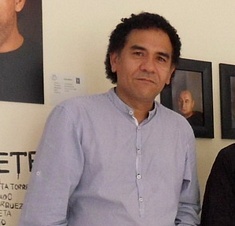 Some of his most notable exhibitions have been in institutions such as Galeria Praxis, Museo de Arte Moderno de Queretaro, Museo Casa Diego Rivera in Guanajuato, Praxis Lima Peru, Center for the Fine Arts in Miami, Community Art Council in Vancouver, Dallas Art Fair, Slato Gallery in Caracas and the National Gallery in Taiwan. He currently lives and works in his studio in Culiacan Sinaloa.